There is a tendency for any type of nasal drainage to be attributed to "sinusitis" in children. Especially in young children, "sinusitis" is a relatively rare cause for nasal drainage and congestion which is actually more commonly due to viruses and enlarged adenoids. The reason why sinuses play a relatively minor role in nasal drainage and congestion is because sinuses are not fully developed in children. It probably is not until around the age of 7 years old that "sinusitis" starts playing a more major role in disease manifestations. And even than, viruses and enlarged adenoids still play a major role in sino-nasal discomfort and as such, antibiotics not typically warranted. Take a look at sinus development from newborn to adulthood below. 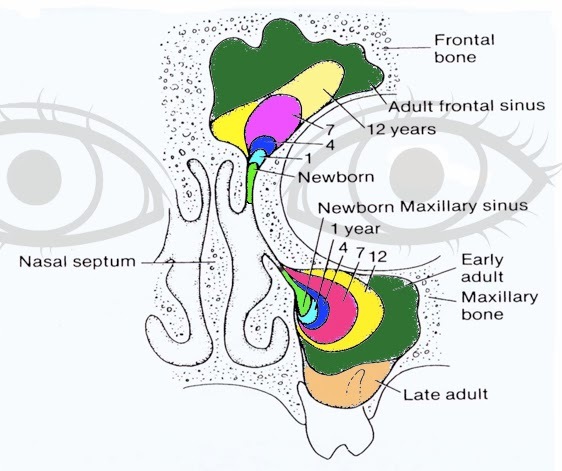 In newborns, sinuses are mere indentations in the facial bone (light green). Adult sinuses are denoted by the dark green/peach. It is for these reasons that sinus x-rays (or radiological imaging in general) are not warranted in children under 2 years. First, there is not much there, and secondly, x-rays are notoriously poor at diagnosing true sinus pathology [more info]. From 2 years to adolescence, sinus x-rays provide some guidance as to the presence of possible sinusitis, but CT Sinus scans are the gold standard to evaluate sinus disease presence or absence. With persistent sino-nasal symptoms in children in spite of medical management, nasal endoscopy can be performed to evaluate the nasal cavity as well as the adenoids. Initial surgical management include adenoidectomy with or without turbinate reduction. While sedated for surgery, allergy testing can also be performed. If symptoms persist after these interventions, a CT Sinus scan can be obtained and consideration for sinus surgery can be made. The reason why CT Sinus scans are not obtained earlier is because whether it comes back normal or not, management does not change unless there are unusual extenuating circumstances present (significant eye or facial swelling).